At PAX East 2019, we had the opportunity to enjoy a quick demo of Trover Saves the Universe, the latest titles from Squanch Games. 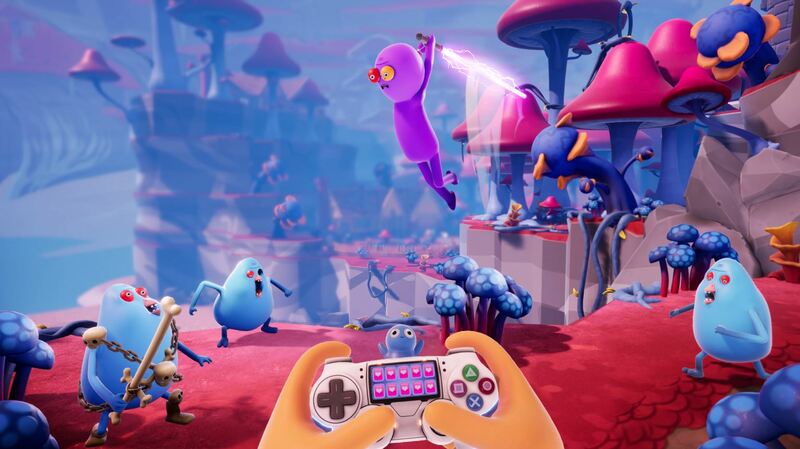 Conceptualized by Justin Roiland, one of the masterminds behind Rick and Morty, Trover Saves the Universe is a unique game with a heavy emphasis on bizarre, dark comedy. While players have the option to play the game in VR, the game also offers a TV version for those who may be interested but lack access to a VR headset. To see how the TV version holds up, we opted to try that version as opposed to the VR demo. Both versions appear to be identical, with VR being more immersive and TV offering a way to easily share the experience with others. The core gameplay has you controlling a character who's bound to a chair who must guide another character by the name of Trover in exploration and combat. As for the premise, the game opens with an evil entity snatching up two dogs and shoving them into their eye sockets. From the start, we couldn't hold back our laughter at the weird visuals that greeted us. The game then cuts to you in your apartment, sitting in your chair, watching TV. The program playing on the TV is highly relevant in that it depicts a couple fighting with each other about things like chair rotation, thus prompting you to rotate your own chair. Everything inside of your apartment can be interacted with, though your indoor exploration is eventually cut short by the arrival of Trover and a breaking news report about a monster (the same one the game opens with) causing mass destruction. The monster also appears to have been powered up thanks to the dogs it put into its eye sockets. Your dogs. The rest of the game, you'll have to partner with Trover to stop this monster from wreaking even more havoc, and of course, to rescue your beloved dogs. Having quickly fallen in love with Trover Saves the Universe, we stepped aside to interview JD Cragg, lead artist on Trover Saves the Universe, in order to learn more about the game. 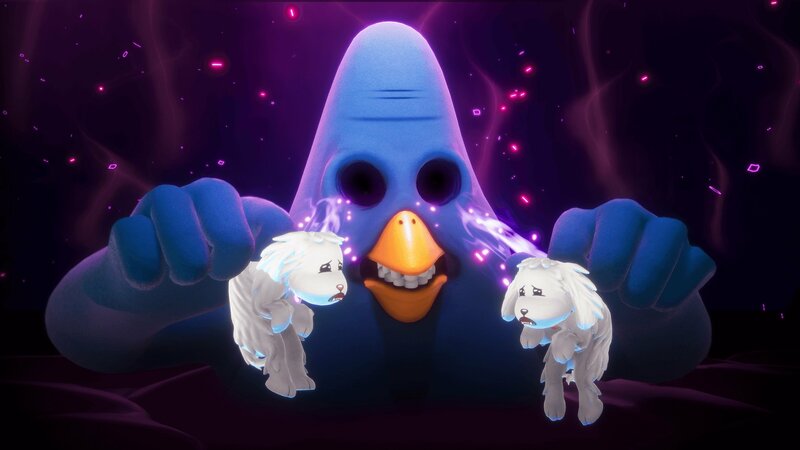 Trover Saves the Universe opens with a monster shoving both of your dogs into his eye sockets. Trover is a comedy, buddy cop adventure where you go across the universe and try and save your dogs. Everything that Squanch Games does serves comedy. Justin had this idea in his head – when he founded the company, this was his baby – and he started working on it immediately. Every weird thing that happens in the game, everything comes out of just trying to make it funny. Speaking of Justin Roiland, we heard his voice a lot in the game demo. Does Justin voice all of the characters in Trover Saves the Universe? We noticed there’s a very interesting style of gameplay where you’re not directly controlling yourself, you’re controlling Trover. Where did that idea come from? I think it originally came from being in a seated VR experience. We always wanted you to be in VR but seated as that helps with motion sickness, and people seem to enjoy that. We also thought it was funny where there’s a character bound to a chair and you control Trover that way. We found a way to make that funny and wrapped into a story. In Trover Saves the Universe, you play a character bound to a chair that's able to control Trover in exploration and combat. There’s combat in the game where you can have Trover attack but there appears to be consequences as well? How does the combat work? All of the characters you meet in the game have decisions to make, and they react differently based on what you do around them and for them and to them. We have a bunch of dialogue to support that. As far as the combat goes, you’ll get upgrades for yourself and for Trover where the combat opens up a bit more and changes a little bit as you go through the adventure. Another question we had was about the dogs, as they look very familiar. Is it intentional that they look like Snowball from Rick and Morty? No, it’s more that they kind of remind Justin of some stuff close to his heart. The art style can be pretty similar because it’s very much Justin. When he designs stuff, we try to figure out how to make it work in 3D, and it’s a very back-and-forth thing. 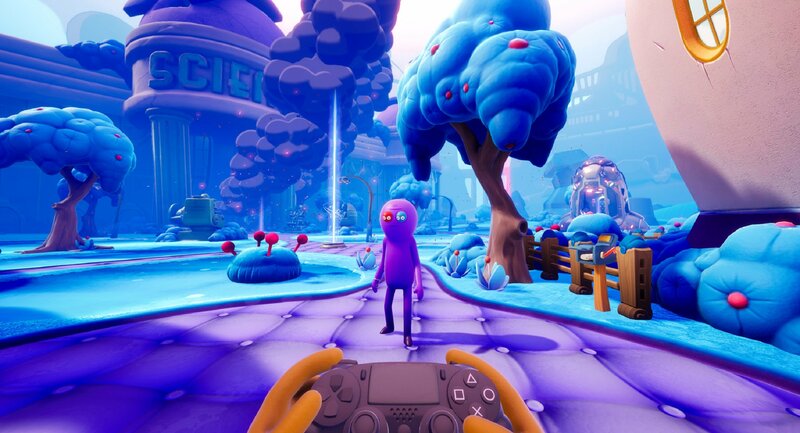 You can choose to play Trover Saves the Universe in VR, or not in VR. Are there any differences between the two options? You can swap back and forth between the two, you just hit “Start” or “Options” to turn VR on and off so whichever version you buy you have the VR version and you have the TV version. I think they both have their merits. It’s great to have the TV version to show your friends where you can sit around on the couch and play together if you don’t have VR. 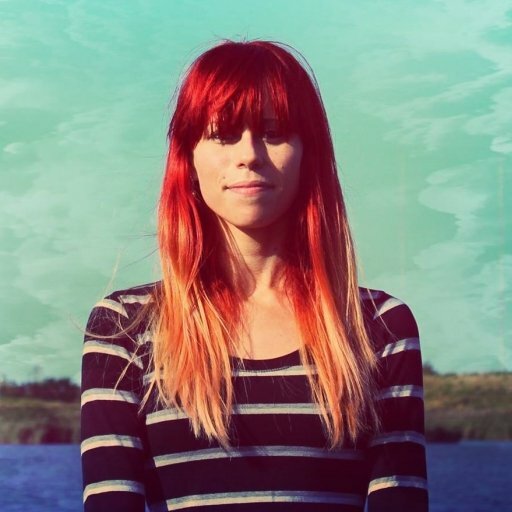 If you have VR, it’s very immersive where you shake your head “Yes” or “No” as you physically have to do that. I think that’s cool as it’s like you’re there with the characters interacting with them. Trover Saves the Universe will release on PS4 and PSVR on May 31, and PC on Steam and the Epic Store on June 4. What kind of platforms will the game be on? We’ll be on PlayStation and PlayStation VR on May 31st. We’ll be on PC for Steam and with the Epic Store on June 4th. With Trover being a comedy style adventure, how much content is there? Are there different paths that you can go on, or is it more linear? Yes [there are different paths]. There are collectibles, and you’ll have different decisions and interactions with various characters. Like Justin showed in the panel the other night, we have hours and hours and hours of dialogue. You can actually just stand there and do nothing and they’ll just keep talking. They’re not repeating lines, they have a whole bunch of stuff they’ll talk about. You can even go back in a level – like in the demo you played you can go back in the apartment – and watch TV for a while. The TV will come on, a program will come on, and Trover will get mad at you because he’s like, “Hey, let’s go do this thing.” If you just sit there he’ll go, “Alright, guess we’re watching TV now.” It’s pretty packed [with content]. Our final question is, what do you think the main thing people who saw the trailer and might be interested, or who like Justin Roiland, should know about Trover Saves the Universe? It’s just the idea where, I think comedy in video games is pretty difficult, and I think we genuinely have something that’s really funny and a little foulmouth, but that’s ok. It’s Justin’s humor that you’re getting. It’s a really good comedy adventure. We want people to play it, enjoy it, and laugh.